The original Planet of the Apes famously began in medias res, throwing a human ostensibly like us into a strange topsy turvy world the beginnings of which were only hinted at in one of the most iconic twist endings in film history. Later sequels would employ time travel to fill in the gaps of just how human civilization would give way to an ape dominated world, but thanks largely to test audiences and studio interference, the series never fulfilled its promise of developing a truly cyclical, and thus utterly hopeless, narrative. The new series seems to be trying to tell more or less the same story in roughly chronological order, only updating the pseudoscience to exploit modern day fears of viral apocalypse that have superseded nuclear paranoia. The result is entertaining in the short term, but I can’t help but wonder if this approach may doom this franchise, ironically enough by forgetting that doom should always be the central conceit. 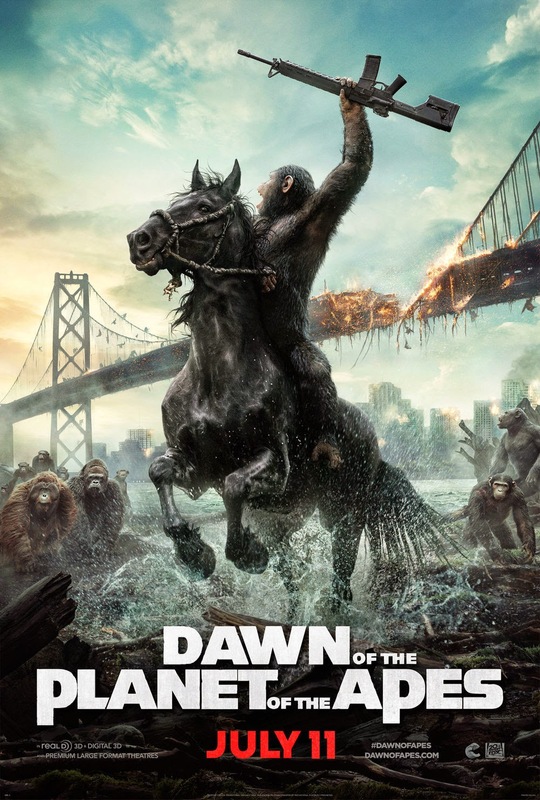 Dawn of the Planet Of The Apes should really have been called Rise of the Planet of the Apes in retrospect, with the first film in the reboot series bearing the new title. Of course, I say reboot, but then exactly what we should call this series has always been a bit confusing. Is it a reboot, a prequel, or some combination of both? Its certainly a different take on the story in its own universe, and yet similar enough that there are certain expectations tied to it. Whether it is fair to saddle this essentially original timeline with the standards of a completely different and much older series is a tough question, but then they shouldn’t have tried to play in the sandbox of such a well known property without allowing for this kind of analysis. As the modern series progresses, it becomes more important to ask just what it owes to the original films that inspired it, and how closely it must hue to what we know of the previous story in order to remain faithful to them. Rise, for example, has often been compared to the fourth film in the original series Conquest of the Planet of the Apes, and in many ways its sequel feels just as much like a remake of the fifth and final original film Battle for the Planet of the Apes. 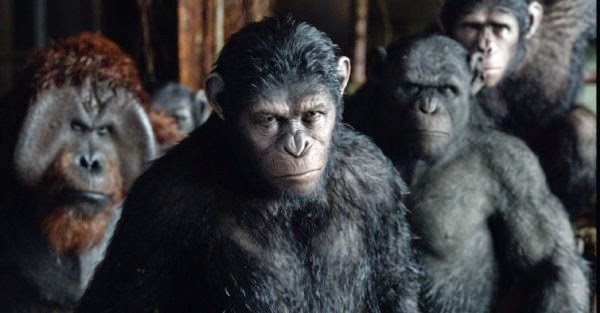 Both feature Caesar leading a more fledgling society of post-revolutionary apes struggling to maintain a fragile peace with what is left of the human population, only to find territorial conflict between the two groups to be inevitable. The problem is, Battle represented the end of a saga, while Dawn is only the beginning of a new one, and with its connection to the other series being so nebulous, its hard to see where this one can go from here that doesn’t either mire the story in stagnant ape on human warfare, or so radically change the setting and structure of the story in such a way that its core audience might not be prepared for the shift in tone or sense of realism. Its hard to explain exactly what I mean by this without excessive spoilers, but in effect, Dawn runs up against the need to expand this world from the experience of one small group of apes crossing a bridge to a whole civilization overtaking what was once the human world, and doesn’t quite know how far it wants to go. 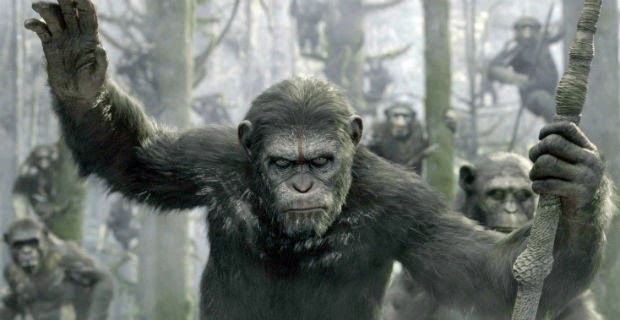 The biggest problem with the movie is that it doesn’t really progress the story of Caesar and his ape army any further than where we left them at the end of the previous film. Assuming that you were as ready as I was for the inevitable coming war between apes and a virus addled human race, you might be forgiven for being somewhat underwhelmed upon discovering that Dawn does not represent that war in its entirety, as much as the first of what is implied will be many battles to come. 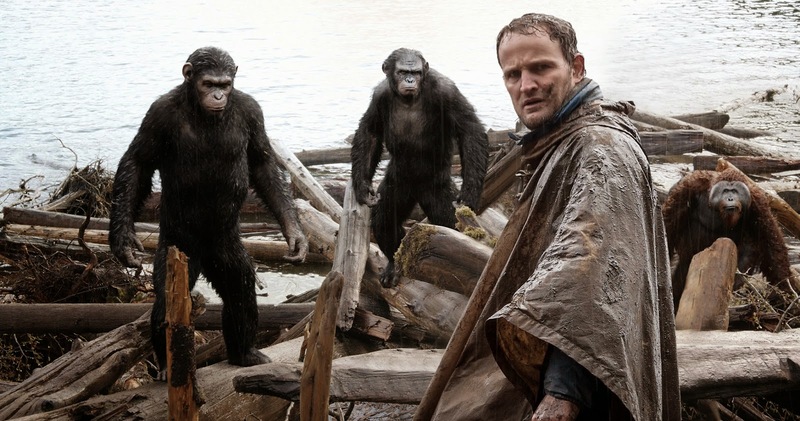 In the end, the apes are still exactly where they were at the beginning, waiting for the war they started to escalate. A friend of mine who also saw the film defends this by describing the skirmish in Dawn as the proverbial shot heard round the world, that point of no return promising an escalating conflict to come, but here I kind of thought a bunch of monkeys taking over an entire forest and inadvertently reducing the world’s population to a frightened fraction of what it once was already did that. 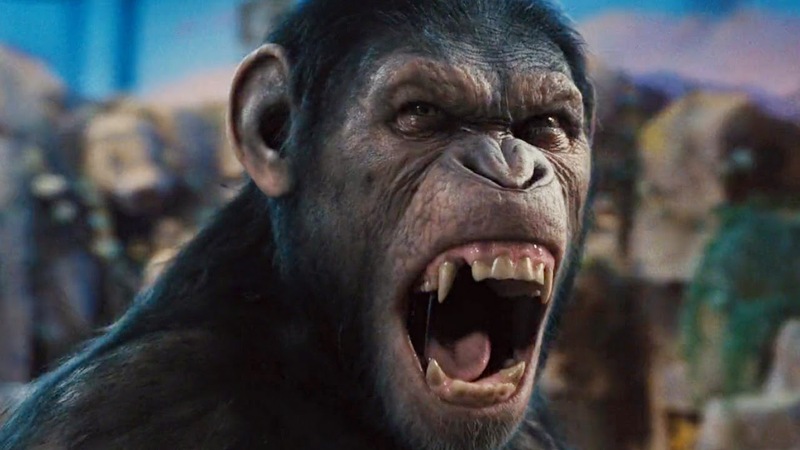 Sure, Caesar learns a valuable lesson about not assuming apes can’t be just as evil as humans, but did we really need a whole movie just for that when we could have been setting up time loops, psychic mutants, and hot monkey on astronaut romance? But there I go again, holding this new series to the standards of the previous one, when I should just be thanking my lucky stars that it was able to somewhat miraculously wash out the taste of Tim Burton’s terrible remake out of our mouths with seemingly little effort. Its just that the thing that made the original series so great is that it was actually about the Planet of the Apes, which is to say it was more important than any one protagonist. Heston is the hero, then a minor character, then Zira and Cornelius take over, only to be replaced by their son Caesar. This new series is far too married to Caesar as its focus, due in large part to Andy Serkis’ much heralded performance, and I question whether it can sustain a time jump refocusing on a different character. At the moment, it almost feels like they want to show us the evolution of apes from beasts to intelligent creatures in real time as if that will somehow make the idea more plausible, but at some point you have to just leap forward and show us their world in its full madhouse glory. Or maybe you don’t. Maybe we never have to see the crash of the ship hinted at in a quick scene in the first movie. Maybe we never have to expand outward at all, but then is it really the Planet of the Apes at that point, or just, like, the Town of the Apes? Doesn’t really have the same ring to it. Then again, we do get monkeys on horseback wielding double machine guns and riding tanks, so on some level all of this is just nitpicking. Purely as an entertaining summer blockbuster, Dawn of the Planet of the Apes is certainly satisfying and perhaps more thoughtful than most, even if the fourth Transformers movie managed to show more promise for future installments. Though we never quite move forward, its still fun just to watch this innocent forest dwelling society slowly develop a more complete and complex understanding of the world that came before and the world they will be helping to create (assuming we ever get there). 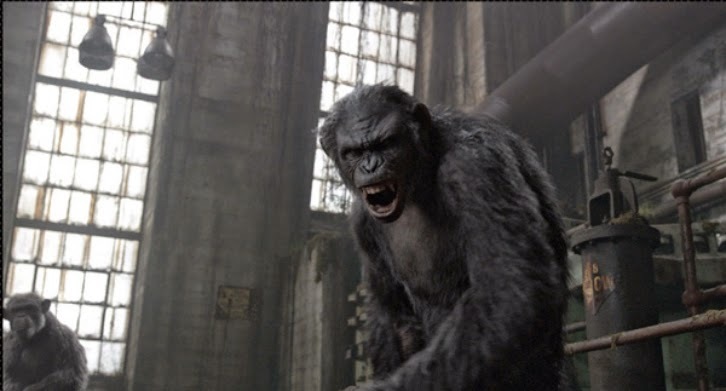 For better and for worse, this is Caesar’s story, and you couldn’t ask for a better ape to latch onto for an emotional arc (though personally I found his second in command and would be antagonist Koba just a bit more interesting and dynamic, but then I’m a sucker for Judases, or Brutuses as the case may be). Here’s hoping the next movie manages to be at least as entertaining AND actually have a point to it. Or at least mind controlling subterranean mutants. They were awesome.